Slim and ultra-crispy for spreading, or nibbling. Charming with a canapé. Splendid with soft cheese. 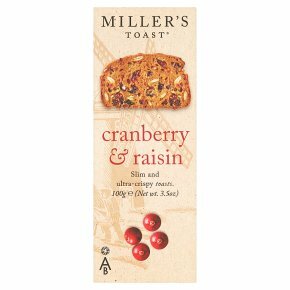 Suitable for vegetarians.Miller's Toast Cranberry & Raisin. The slimmest and crispiest 'toast' to partner foie gras, paté, cheese, or just to nibble. To crisp, reheat in a cool oven at 150�c for five minutes.